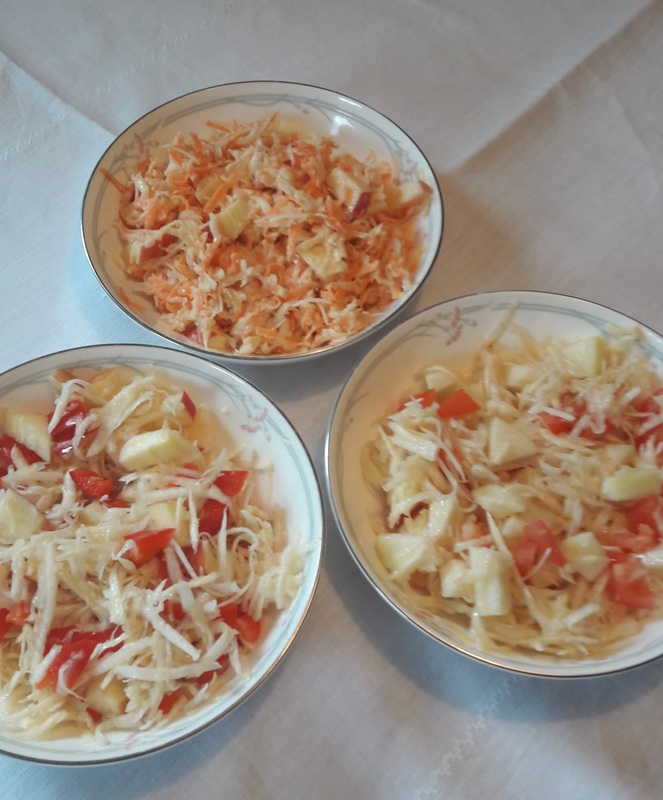 My Polish friend who lives in Leeds, just came back from a visit to Poland and mentioned a celeriac salad with carrots and apples that she had enjoyed. This started me thinking and I made this one and then I tried out a couple of other ones as well. Peel and then coarse grate the carrots. Coarse grate 2 of the apples. Leave the skin on the other apples, remove the core and chop it into small pieces. In a bowl mix the celeriac, carrots and apple together. Add the juice of a lemon and the soured cream and mix well. I think this tastes best when made a few hours before serving. Peel the pears and remove the core and chop them into small chunks. Chop the tomatoes into small chunks. Add the olive oil and lemon juice and mix. Chop the red peppers into small squares. Blanch them with boiling water and leave to cool. Strain and the dry the peppers – with a clean tea towel or kitchen paper. Leave the skin on the apples, remove the core and chop them into small pieces. Served in Carnation by Royal Doulton dishes from 1982 – 1998. I came across this recipe for potato salad which instead of using mayonnaise has a dressing made with honey. In my other potato salads, I use starchy potatoes but with this dressing the firmer more waxy potatoes work best. Mix all the salad ingredients together and place in a bowl. Mix all the dressing ingredients together – use a little whisk. Mix the salad with the dressing. The salad is best made several hours before serving to let the dressing infuse into the potatoes. Add the garnish just before serving to prevent the leaves becoming soggy. The dressing is so delicious – I will be trying it out on other salads and vegetables . As I was trying out some herring salads I came across the following mixture which worked so well together. I decided it would make a good salad mixture on its own. Originally this would have been made with soaked and then boiled haricot beans – for ease I use a tin of baked beans from which the sauce has been washed off. 1 tin of haricot beans (tinned beans (410g) with the tomato sauce washed off , rinsed and patted dry). 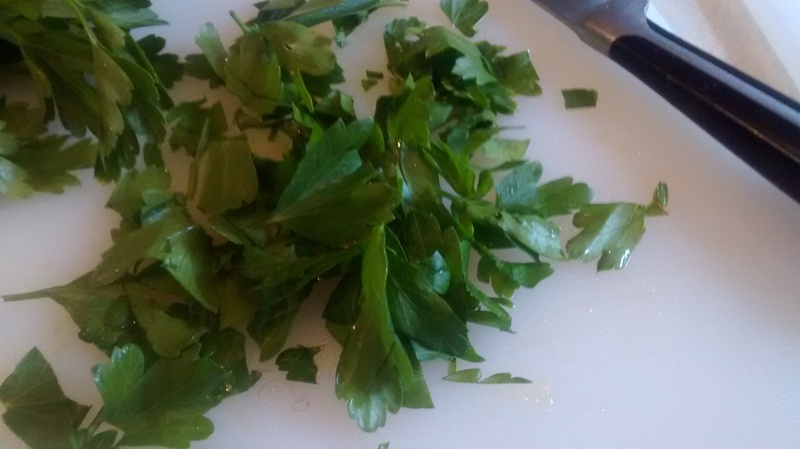 You can sprinkle chopped flat-leaved parsley on top when serving. 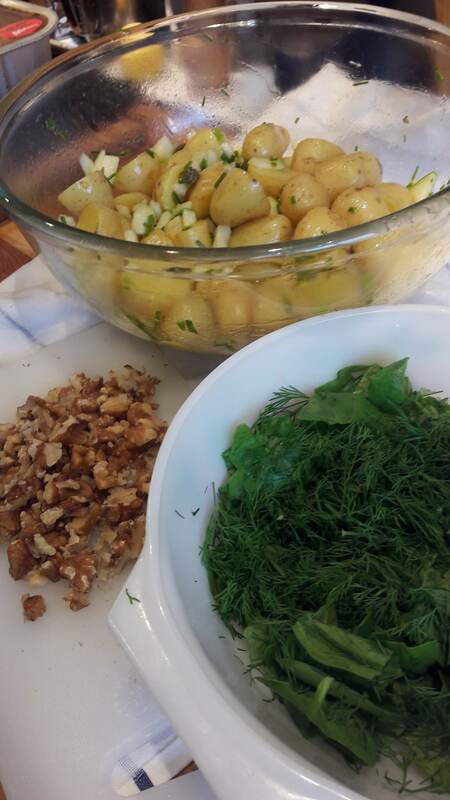 When I think of Polish cooking three popular herbs which always spring to mind are caraway, dill and parsley. They all belong to the Apiaceae family which includes carrot and celery. This family is also called Umbelliferae (from the Latin – umbella – for parasol or sunshade) – the flower heads consists of umbels which have equal length flower stalks coming from a central point which forms a flattened head – rather like an umberella. Carum carvi is caraway – kminek – in Polish. It is native to Europe, North Africa & Western Asia. Caraway fruits are often called seeds. Caraway is thought to be an aid to digestion. In 2011 Finland supplied over 25% of the world’s caraway. Caraway is often added to rye bread, to dishes with sauerkraut and also many meat dishes, especially pork, such as Sauerkraut & Bacon, Pork & Prunes and Pork & Sauerkraut Gulasz. Anethum graveolens is dill – koperek – in Polish. 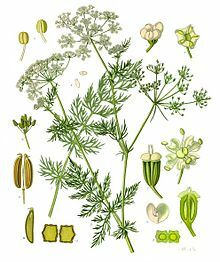 Dill is grown for its leaves, which are fern like, and its seeds. Dill leaves are best when used fresh (I never bother with dried dill). Dill leaves are used as a topping for many salads and for boiled new potatoes. Dill leaves are added to twaròg (Polish soft curd cheese) and smetana (soured cream). 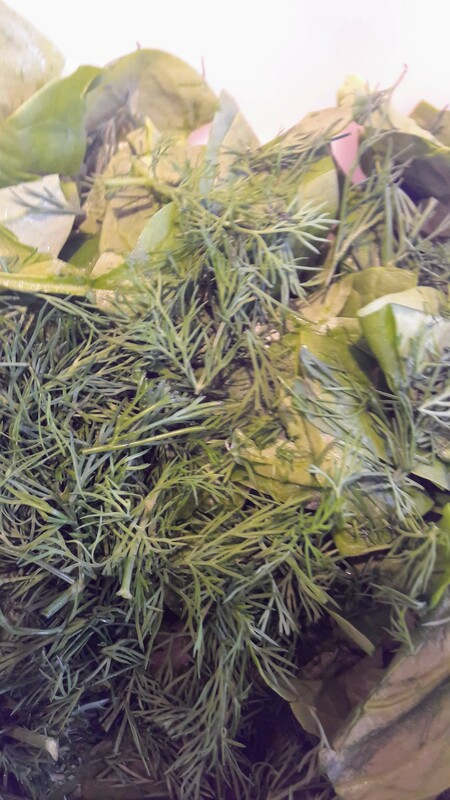 Dill leaves are used in sauces including ones served with fish. Dill seeds are similar in flavour to caraway seeds. 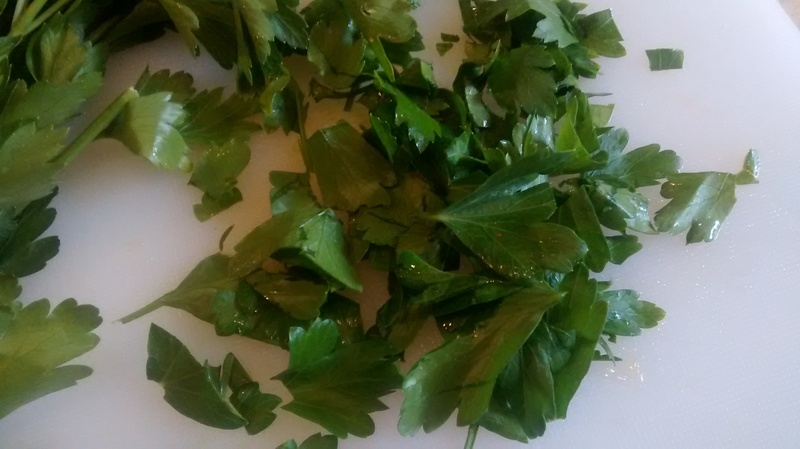 Chopped flat leafed parsley leaves are added as a garnish or topping for many salads and savoury dishes. This is Parsley root or Hamburg parsley. Flat leafed parsley is also grown for its white tap root which looks a lot like parsnip and is also used in Polish cookery, often added to casseroles. 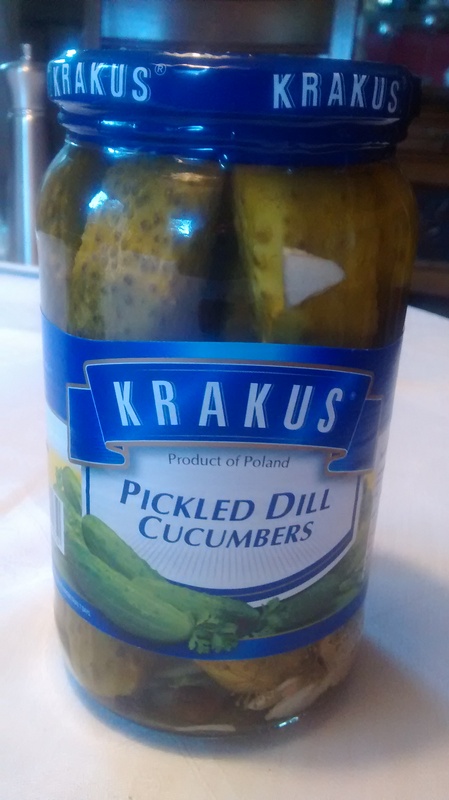 I have seen this for sale in Polish markets, you might find it in the larger Polish shops that have fresh produce. Parsley root grated with apple or pear and with added lemon juice is one suggestion for a fresh salad. Capparis spinosa is the caper bush. The plant is best known for the edible, unripened flower buds – capers – kapary (in Polish) which are often used as a seasoning and are usually pickled in brine, vinegar or wine. These perennial plants are native to the Mediterranean and some parts of Asia. Their use dates back to around 2,000 BC where they are mentioned as a food in Sumerian literature. The caper buds are picked by hand which can make the cost of a small jar expensive. Pickled nasturtium (Tropaeolum maius) (nasturcja in Polish) seeds – often called poor man’s capers are a good substitute. Capers have long been used in the Mediterranean region especially in Italian cooking. 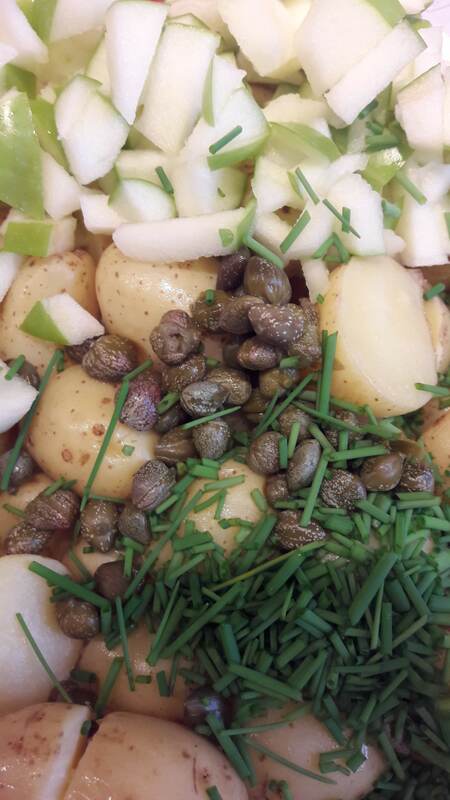 Capers are usually added to the dish toward the end of the cooking process, to keep their shape and flavour. This is very popular in Poland and is made with chopped capers and mayonnaise and is served with hard-boiled eggs. 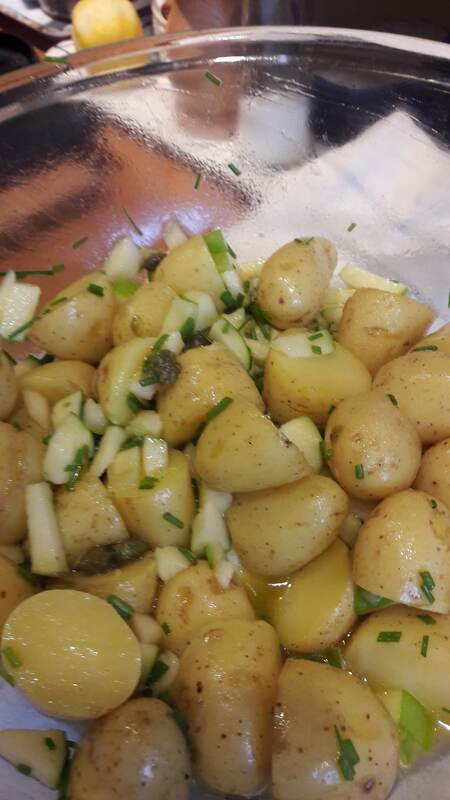 This is my variation of the classic Polish potato salad with caper sauce. The potatoes, green beans and the peas all need to be boiled or steamed, drained and then dried as much as possible using a clean tea towel. I usually use starchy potatoes for potato salad but have found that waxy ones are better for this one. Chop the beans into small pieces. Chop the green parts of the onion into fine pieces. In a bowl mix the cooked and dried vegetables, the capers and the spring onions. Mix together the mayonnaise and the mustard. I have found that the lighter sort of mayonnaise soon makes this salad have a watery dressing after a very short time. 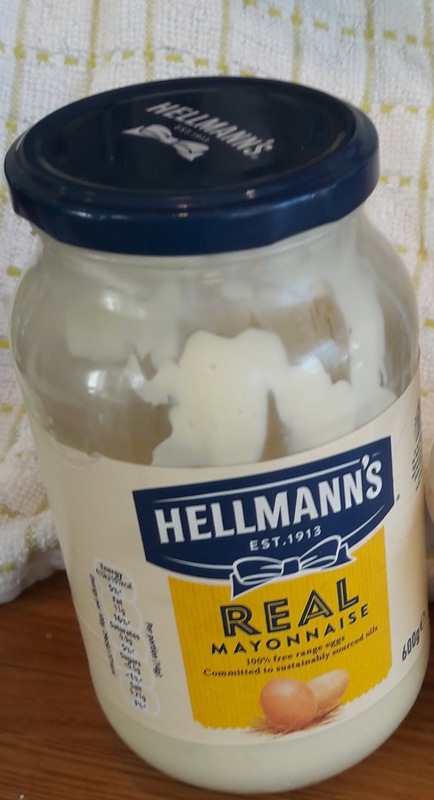 It is better to use home-made mayonaise or a good bought one – I use Hellmann’s. Mix the vegetables with the dressing and add salt & pepper to taste. 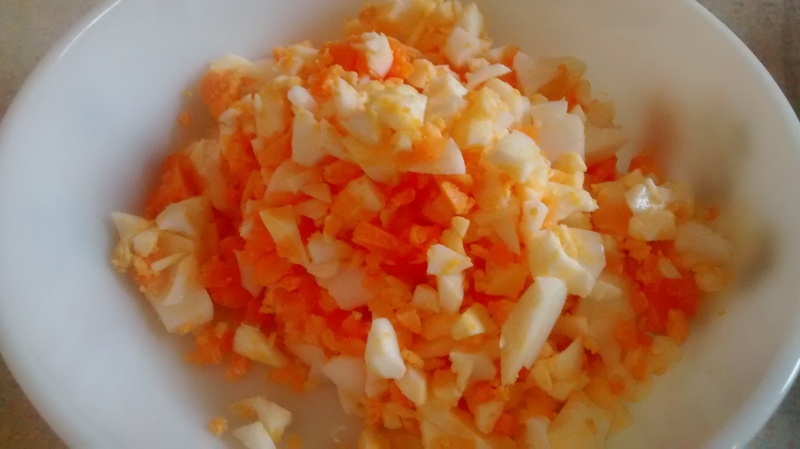 Chop the hard-boiled eggs and scatter these on the top of the salad to serve. 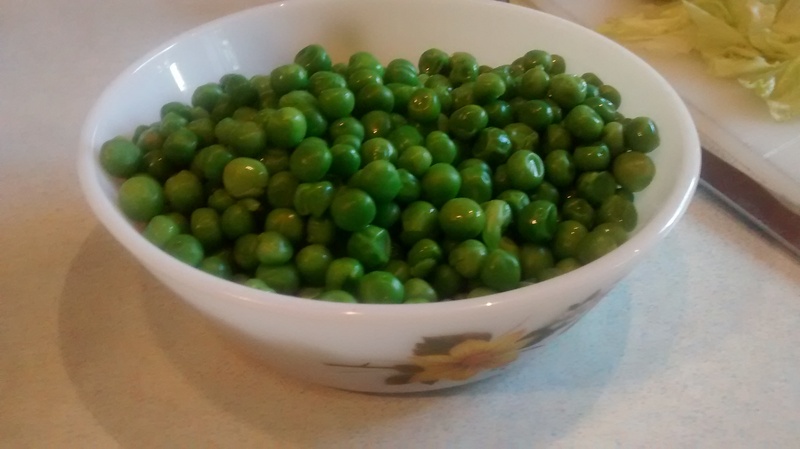 Posted on January 27, 2018 Categories China & Tableware, Eggs, Polish Cookery, SaladTags Capers, Green Beans, Hard Boiled Eggs, Mayonnaise, Peas, Potaoes, Salad1 Comment on A Little Caper! The general word for pasta in Polish is makaron .. from the Italian macaroni or maccheroni which is thought to originate from the Greek makaria – food made from barley. 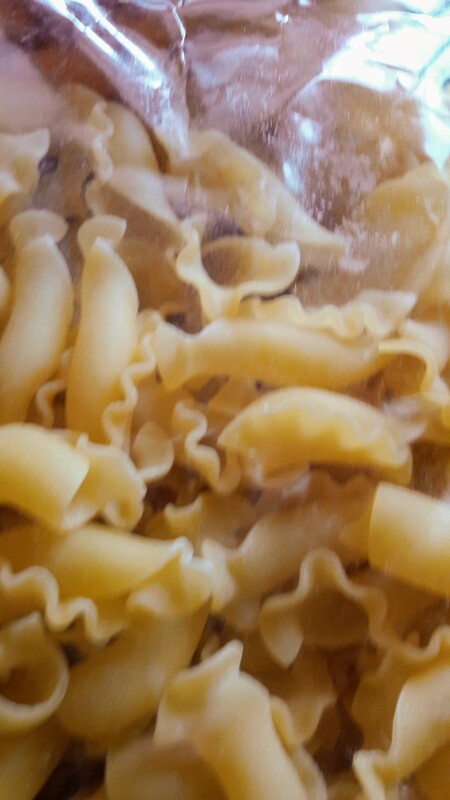 You need some cooked pasta – small shapes are the best – I often use Fiorelli – little tubes with lacy edges. When I am cooking some pasta for a meal, I often do a bit more so I have some left to make a salad the next day. Try not to over cook the pasta. The weight of dry pasta will result in around double the weight of cooked pasta eg 250g of dry pasta will result in around 500g of cooked pasta. I find that mayonnaise or mayonnaise based dressing are best with these salads. Cooked vegetables work well with these salads and also tinned or bottled vegetables and so it is a good store cupboard dish. Below are several ideas – but you can do many variations – I always use a few different colours to make it look attractive. 400 – 500g cold cooked pasta. 1 or 2 fresh red peppers or 2-3 pieces of bottled peppers. In a large bowl mix the pasta and sweetcorn together. If using fresh peppers then remove the stalk and the seeds and chop the flesh into small pieces. Blanch the peppers by putting them in a dish with boiling water and letting them stand for about 10 minutes then drain and pat dry. If using bottled peppers then drain them from the liquid and cut into small pieces. Add the peppers to the salad mixture. Salt & ground back pepper. Salt & pepper to taste – you will need less salt if you are using the tuna in brine. Make the salad as in Pasta, Peppers & Sweetcorn Salad up to the addition of the mayonnaise. Break up the tuna into smaller pieces and add this to the salad and mix it in. Salt & pepper to taste – (you will need less salt if you are using the tuna in brine). Add some chopped chillies to the mixture – I use green ones to differentiate them from the red peppers. Pasta, Peas, Peppers & Sweetcorn Salad with Polish Smoked Sausage. Make the salad as in Pasta, Peas, Peppers & Sweetcorn Salad. 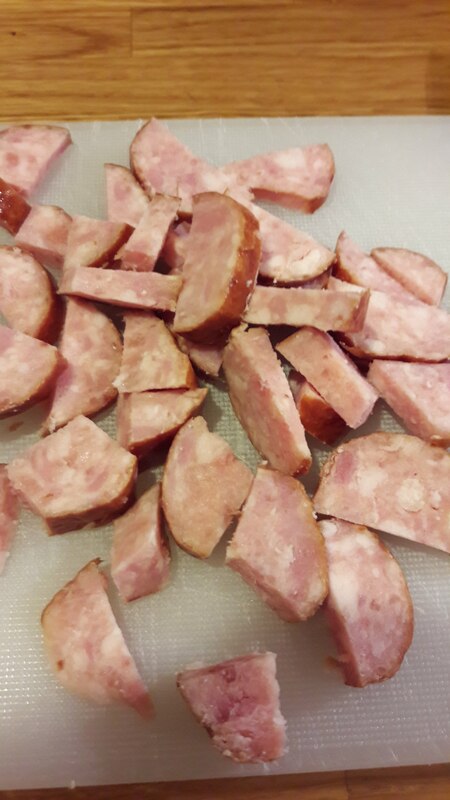 Slice the sausage into thin slices and then chop these into halves and quarters. 1 or 2 hard boiled eggs can be chopped and used to garnish the tuna or smoked sausage salads. For these salads you will need some cold cooked rice – I use long grained or Basmati rice – but it can be whatever you like to use. 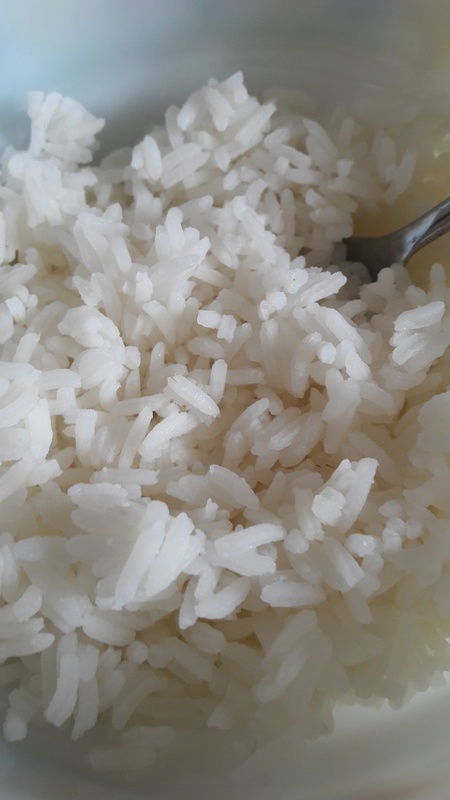 I rarely cook the rice specially – I am more likely to use what is left from a previous meal. However for these I cooked some rice to see how much was needed. I find the best dressing for these salads is one based on lemon juice with the addition of some runny honey if you want a little sweetness. In a large bowl mix the rice, peas and sweetcorn together. Pour over the juice of the lemon and mix well. If you are adding honey then warm about 1 tablespoon gently and mix that in. I often blanch the peppers by putting them in a dish with boiling water and letting them stand for about 10 minutes the drain and pat dry. Not long ago I spent a stitching week in Castor, Cambridgeshire, with a group of super ladies. I was responsible for some of the catering. One evening there was a large amount of leftover cooked rice, peas & sweetcorn, so I decided to make this into a salad with other ingredients we had in the kitchen. This turned out to be a delicious salad and it got a lot of approval & I will certainly be making this again. Juice of 1 – 2 lemons. Chop the leeks as fine as you can into circles and then cut these into half and put them into a large dish. Cover the leeks with boiling water and leave them to stand until the water is cool. Strain the leeks, leave them to cool down completely and then dry them with a clean tea towel or kitchen roll. Mix the rice, apple & vegetables together in a large dish. Pour the lemon juice over the salad. This was served with a beef in beer gulasz (casserole) & the salad provided a good balance against the richness of the casserole.